A week ago today, we launched the new PLANET ARGON web site. That went great! 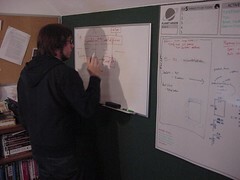 Then, late last week, Jeremy Voorhis and I announced that we were working on a top-secret project, Refactoring Rails. Thought that was it? Guess again. We are exicted to announce that this Saturday, Jeremy Voorhis will be catching a flight from Pittsburg to Portland to come and join the PLANET ARGON Core Team. We’ve been working with this highly talented individual on several recent development projects and it only seemed natural that he play a more active role in PLANET ARGON. So we asked him to pick up, move to Portland and join the team here. Well, Jeremy took us up on the offer and is preparing for the big move as I type this. Portland Ruby Brigade, expect to see a new face at the December meeting! UPDATE: Yes, this means that Jeremy will join us out West to work with Ruby on Rails all-the-time!